A house is not a home until it's your oasis. A great way to create your sanctuary is to ensure the house fits into it's surrounds by providing landscaping which reflects context, promotes wildlife conservation and creates a beautiful and healthy environment for you and your family. Nature is good for us. 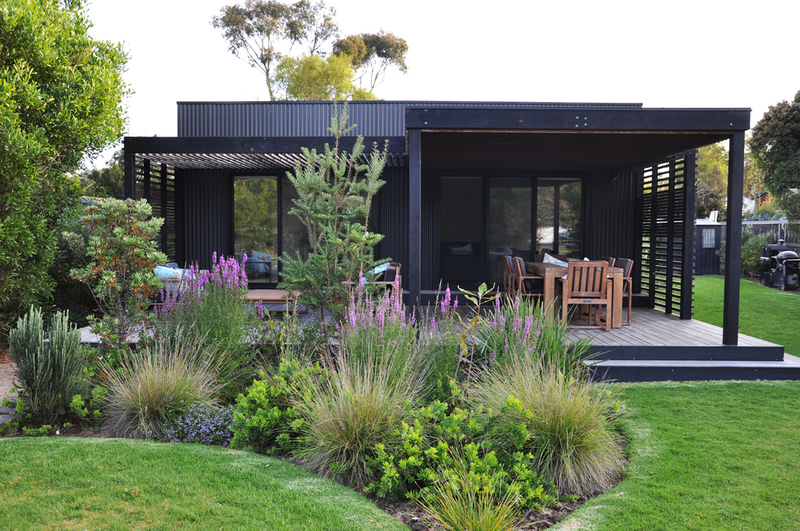 At Archiblox, we always encourage clients to think about indigenous landscaping when building a new home or renovating. Planting a native garden is beneficial as they naturally grow better, saving money, time, and resources in comparison to plants which are more exotic. These endemic plants tell a story about the origins of the land and it's inhabitants, paying respect and preserving indigenous culture for years to come. With the Melbourne International Flower and Garden Show on this weekend it's a great opportunity to get some inspiration and use your green thumbs to get those gardens happening. Landscapes produce oxygen and eliminate dust, smoke, pollutants, improving the quality of the air we breathe. Being outdoors can reduce inflammation in the body, which in turn reduces autoimmune disorders, irritable bowel syndrome and even cancer! While the research into cancer prevention is still in the early stages, studies suggest that time spent in nature can stimulate the production of anti-cancer proteins. Another benefit to being outside includes a boost to the immune system, allowing the body to better fight routine illnesses like colds and the flu. Studies have shown that looking at plants and trees can lower blood pressure and levels of the “stress hormone” cortisol. High levels of cortisol have been linked to issues with learning and memory, weight gain and heart disease. The positive influence of landscaping are effective on our mental state not just physical. Multiple studies have shown that walking in nature improves short-term memory. Symptoms of anxiety, depression and other mental health issues have also been shown to improve with time spent outside. One study that analyzed 10 other studies on “green exercise” notes that exercising outdoors instead of inside improved both self-esteem and mood in study participants. Research has shown that three to five minutes of looking at trees, flowers or water can induce a relaxation response and reduce anger, anxiety and pain, and a study of hospital patients found those who had a bed that looked out of windows towards leafy trees had shorter hospital stays and required less pain medication than those staring at blank walls. Edible plants, like fruits, vegetables, herbs, and spices provide additional health and environmental benefits associated with organic or local foods. Growing your own fruits, vegetables, herbs, and spices is a fantastic way to limit the produce contaminants, hormones, and pesticides you’re exposed to. In addition, local foods are significantly less taxing on the environment because they require fewer resources to reach end consumers. You can't get more local than your own home! If your a beginner, some easy options to start with which are hardy and require minimal effort are; Aloe vera (the jelly in each stalk is a natural treatment for burns and irritated skin, and juice from stalks is delicious and soothing), Radishes (rich in ascorbic acid, folic acid, and potassium), Basil, thyme, rosemary, mint, and other herbs (fresh herbs add flavor to foods and teas, and herbs have medicinal properties), and Ginger and turmeric root (extremely anti-inflammatory and medicinal). If space permits, try to incorporate outdoor dining area with a deck to encourage communal dining and social interaction from the indoor areas into the outdoors. If possible add a pergola or verandah to provide protection from the elements and ensure the space remains functional throughout the seasons. Creativity shouldn't be just for the interior of the home, it should flow through into the external environment. So, get involved in your garden, it is relaxing, restorative and rewarding for people of all ages. It's an excellent educational activity for children and for the elderly to keep their minds active. Ignite your senses by planting an array of coloured florals or plants which are heavily scented. Try your hand at mixing different plants together to create textures and tonal differences. By selecting plants with vibrant colours, interesting shapes and scents you can immediately arouse new sensual experiences. This can help to create new neural pathways in the brain! By using a native plant selection and gardening method you can better support the local eco system. By eliminating artificial turf and replacing it with native grasses or a lawn, choosing indigenous plants that are seed producing, flowering and berry bearing will encourage birds and bees. This will help your garden be self sustaining and prosper in the long term. When arranging a native garden, the designs are more ad hoc in layout, plants should be incorporated sporadically. Try to mimic the natural ecosystem you see out in the bush - think beyond green, there are many local wildflowers which are sure to be suitable to you area. If you want to dive deeper into native garden design you can ask a local indigenous elder. Contact your local council to find organisations which can assist you further and provide area specific information on the most appropriate plant species for your region. As a basic start, you could plant a tea tree. It has strong scented leaves and is related to the eucalyptus - you can even make your own tea tree oil from the leaves and use it as an antiseptic. Lomandra longifolia (basket grass) is another great choice as it grows easily all over Australia and can be used for craft or hydration purposes. The Fogarty House was deliberately designed to be small in size, and at 66m2 it allows for ample outdoor space on the block. As the land had never been built on before it was important to the clients to use a prefabricated design and construction. Archiblox were able to ensure minimal disturbance to wildlife and impact on the earth by building this 6-star energy rated home off-site. The sustainable home design is a modern take on a fishing cottage. It has a simple but functional layout. Private sleeping quarters in the back complete with secluded outdoor shower, and an open-plan living area with kitchen in the front for sweeping views of the beautiful gardens. The properties frontage includes expansive glazed doors opening to a large deck. Accurately placed battened awnings and screens provide shade and privacy, encouraging residents to make the most of their outdoor living year round. The house was created in conjunction with Jim Fogarty Design, who developed the landscape concept. 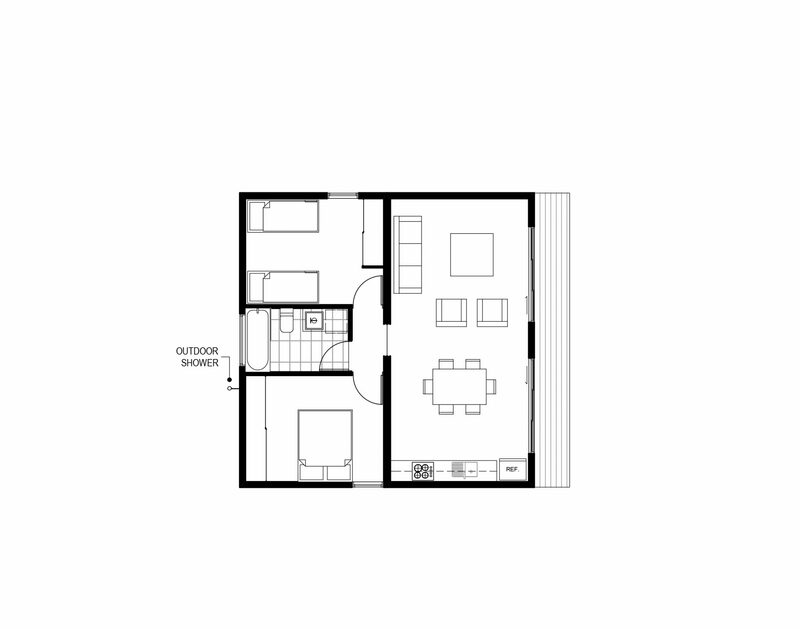 As the property is located in a flood zone it was a key factor when determining design. Australian native plants were selected which were perfect for the soil that would remain wet and heavy for extended periods of time. Inspiration was taken from indigenous shapes to reference the idea of water moving across the land and waterholes. Some of the plants used in this garden have indigenous uses such as tool making to flavouring sweet drinks or brewing teas. The gardens purpose was to engage in cultural stories and preserve the local flora and fauna in this coastal area. The Melbourne Flower and Garden Show is always a popular event in the calendar. Archiblox has participated previously, exhibiting a prefabricated pod which comes built and delivered to your door, the Backyard Room is an innovative solution for the throngs of Australians who are now working from home, allowing people to essentially set up their home office or studio in their own backyard. Image: Backyard Room | By Archiblox Garden and Landscaping Daniel Tyrrell Landscapes This exhibit Won Silver and Gold in Sustainablity at MIFGS.